This book provides a practical approach to the anesthetic management of surgical and nonsurgical procedures across the spectrum of anesthesia sub-specialties. This book will assist the practitioner to plan their anesthetic from preoperative evaluation phase to complete recovery or transfer to another special care area. The emphasis is on both the planned technique and more importantly the logic or reasoning behind the suggested technique. 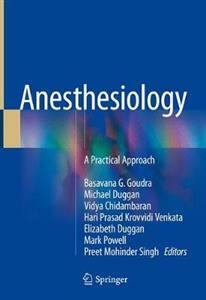 This book addresses all important procedures in anesthesiology, including preoperative evaluation, airway management, and fluid administration. Every chapter discusses a specific surgery or procedure. Some topics of special interest are also included. Anesthesiology: A Practical Approach is aimed at anesthesia residents, anesthesia nurse practitioners, and experienced anesthesiologists called upon to work in any area or anesthetizing location.